This Hand Crafted Elegant Album contains stunning Skirball Cultural Center Wedding Photography. Skirball Center itself is pretty modern in design, and while this wedding also had some modern design elements, it was also classy and formal, making the Elegant Album a great match. When designing the album, both aspects of the wedding were balanced as show here with the black genuine leather cover, silver page gilding, silver modern text imprinting, and silver outlined black and white photograph of the bride and groom on their wedding day. 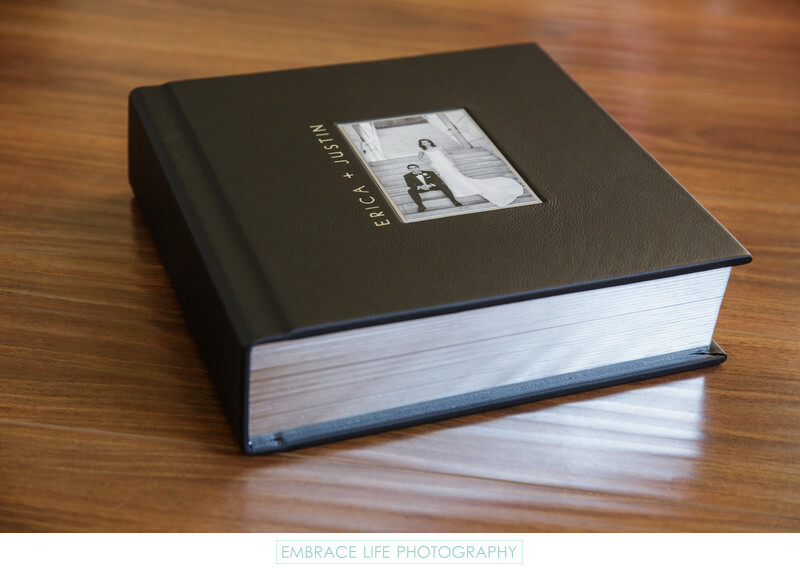 Inside, the pages feature white mats with white liners for a very clean, fine art style wedding album presentation. Location: 2701 N. Sepulveda Blvd., Los Angeles, CA 90049 .